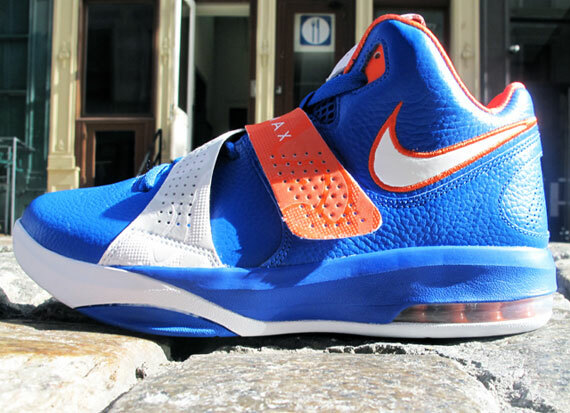 Looking back at Amare Stoudemire’s kicks and you’ll note that they’ve always been strapped down. 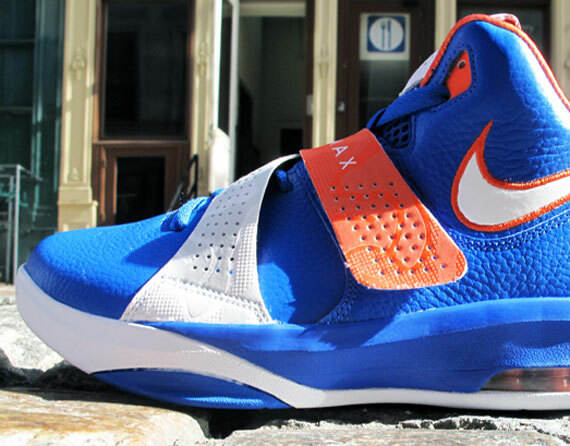 The Nike Zoom Huarache TR Mid, the Nike Zoom KD II, even his signatures like the Nike Air Force S.T.A.T. featured a mid-foot strap to lock-down his feet – just incase he flies out of his shoes. Nike decided to re-up STAT’s contract and almost immediately, he was given an un-official signature shoe – the Nike Air Max Sweep Thru. It features a crossing mid-foot strap with Max Air cushioning on the heel, and this Knicks-inspired colorway can be yours when it drops in Quickstrike fashion this Saturday, October 14th. Keep an eye out for a release this weekend at select spots like 21 Mercer, or if you want to see them in person tonight, head to Foot Locker on 34th St. to see Amare Stoudemire, a sampling of his own sneaker collection, and the new Air Max Sweep Thru on display from 6:30-7:30.